Part two: Fall brings a mix of fieldwork and data analysis. Note: This is the second installment in a three-part series that will describe a year in the life of a DWR fisheries biologist. FALL IS a transitional time for a biologist. It’s also one of my favorite times of year. The season begins amid a frenzy of fieldwork and ends with days behind the desk. The transition between these two modes of work is anything but gradual and naturally anything but boring. During this season it is not uncommon for me to spend one day monitoring fish in an icy mountain stream, only to attend a meeting on fish habitat improvements the next. It’s that sort of diversity that makes fall such an enjoyable time to work. Netted fish at Newton and Willard Bay Reservoirs during routine fishery monitoring. Walked buckets of live fish to a stream on the snowy mountain benches near Kaysville, helping a group of Eagle Scouts with a native cutthroat trout reintroduction. Waded chest-deep in the cold waters of the Weber River while assisting with trout population research. At this time of year, the weather can be some of the best and worst a biologist experiences, but the enjoyment I get from working outside on the brisk sunny days far outweighs the discomfort of blowing rain and snow. When the last fish survey is done, I settle into a regular office schedule. This usually comes as a bit of a relief after all the excitement and unpredictability of a long field season. My role as a biologist is to provide fishery managers, policymakers and stakeholders with meaningful information about the fish in the waters I study. I spend my time in the office analyzing data, writing reports and communicating with other natural resource professionals and enthusiasts. The largest portion of this time is spent analyzing data collected from each waterbody and interpreting the results. I will use the results of these data analyses to write fishery-assessment reports during the winter. 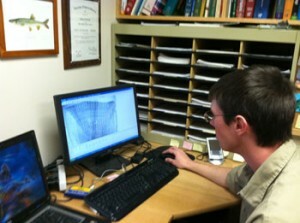 Chris Penne reads fish scales to determine the age and growth of wipers in Willard Bay. My favorite data analysis activity is determining the age and growth of fish populations. To do this, I visually assess fish scale samples. Just like a tree, fish scales have ring impressions that we can use to determine the age and growth of individual fish. The best way to count these rings is to take digital pictures of each scale through a microscope and then analyze them with computer software. I usually look at hundreds of fish scales during each age and growth assessment I perform, recording the age of each fish and taking measurements of each scale. This process requires time and patience, but it provides extremely valuable information that helps me determine how fast fish are growing, how much forage they have to eat and whether they are being utilized properly with current fishing regulations. As I write this, I find that another fall has passed. The scramble to finish my fieldwork is over, and my sampling gear is safely stowed. The seasons are changing and so is my routine at work. There will be some long days in front of the computer, but I look forward to exploring this year’s collected data and determining what it means for Utah’s fisheries. It’s all just part of a year in the life of a fisheries biologist. << (Previous) Dear Santa, I want to go fishing. Chris, thanks for all the work you do. I love to fish and this was a very interesting read for me. I do have a question. How do you age fish that don’t have scales, like channel cats? Hi Wynn. Thanks for the kind words and excellent question! To age catfish, we examine growth in the pectoral spines of the fish- those are the spines attached to the fish’s front fins. Removal of the spine can be done easily with a pair of pliers and doesn’t cause any lasting harm to the fish. Once we have the spine samples back at the lab, we make a transverse cut across the base of each pectoral spine with a low speed saw and use the resulting spine cross sections (which looks like small discs) for aging. Just like with scales, the spines exhibit rings that are associated with the fish growing at different rates throughout the seasons. In some cases, we will also use the earbones of the fish for aging. These bones, called otoliths, often provide accurate insight into the age of the fish, but the tradeoff is the fish must be sacrificed to obtain them. I’m sure that working in the field is much rewarding than working in the computer. Even with the bad weather sometimes, I bet that is better and more rewarding. Have a good day and thank you for the article. Hey Chris. I’m applying to fish and wildlife Master’s programs right now and I’m wondering what your degree(s) are in and whether or not you did a thesis/dissertation. I’m about 99% sure that I do not want to get a PhD, so I’m looking into non-thesis Master’s programs. How is a non-thesis Master’s regarded in the profession? I’m looking to do the same type of thing you’re doing, work for a state or federal fish and wildlife agency. This blog is great, glad I found it! Glad to hear you’re pursuing a career in fish and wildlife! Great question. I have a Bachelor’s degree in Animal Ecology and a Master’s in Fisheries Biology. Seems like having a Master’s degree is the new bar set for incoming biologists, so you’re on the right path for your desired career. I did a thesis study as part of earning my Master’s degree and feel it is the way to go. State and federal agencies are looking for the Master’s degree, and will take on individuals who haven’t conducted a thesis, but the thesis gives you an advantage because it shows that, among other things, you can critically think and write. Additionally, I feel the thesis option is a better financial move because most students in the sciences can get a fellowship or assistantship for their thesis work, which means the University pays you for getting your Master’s degree. Sometimes an assistantship requires being a teaching assistant, but overall, getting either a fellowship or assistantship is a big bonus, because it means you’re getting paid for learning, instead of the other way around. The thesis may appear daunting, but its actually pretty easy to write a large paper on a subject that you study for 2 to 3 years. Overall its about what works for you. If you want to learn more about fisheries schools that offer a thesis programs with fellowships, check out the American Fisheries Society’s web presence and browse their job board. I am looking for some answers regarding Willard Res. I noticed there hasn’t been any stocking of Wiper this year as yet. In previous years starting in June there was. Is there a funding problem. Or has it been determined there was no need for more. My other question is about enforcement of the current limits. I have witnessed little to no enforcement being conducted in the fall when the Wiper are mostly caught. I fish Willard often and have noted there seems to be few Wiper. Excellent questions. You have a sharp eye for the stocking numbers at Willard. It’s possible when you last checked our stocking report, the wiper stocking events at Willard had not been entered into our database yet. Here’s a little more information about our wiper stocking program at Willard. We stock wipers in Willard Bay at two different life stages; fry and fingerlings. This year there were approximately 200,000 wiper fry that were stocked in the reservoir in late May and then 64,679 two-inch fingerlings stocked in mid-July. The wiper fry are recently hatched fish and are just a few millimeters in length at the time they enter the reservoir. Because they are so small, the number of wiper fry that survive to adulthood is relatively low. On the other hand, the cost to produce wiper fry is also quite low and economical. Wiper fingerlings are about 2-3″ in length, and experience much better survival rates than the wiper fry, but cost a lot more to produce. By having these two stocking events, we are giving the young wipers multiple chances to establish in the reservoir. “With the change from a 6 to 3 fish Wiper bag limit at Willard Bay this year, the DWR wrote and implemented an action plan to address possible over limit violations. Since May 26 (Memorial Day Weekend), 11 different conservation officers from 4 counties have worked over 400 hours at Willard Bay. These patrols have been conducted in the form of uniformed officers in marked trucks, uniformed officers in unmarked boats and plain clothes officers in unmarked boats, unmarked trucks and on bicycles. The efforts of these patrols has resulted in approximately 40 citations/warning citations, only a few of which were for over limits of Wiper. The design of the action plan was to focus our efforts on times when and places where angling pressure and angling success were high, when there was a higher likelihood of over limits. The officers spent many hours observing anglers trying to witness over limit violations. In some cases, like when angler success was low, officers may not have even contacted any anglers. Similarly, when working in a plain clothes capacity, officers may not have made any contacts, unless a violation was observed. The Wiper fishing at Willard appeared, in general, to be somewhat slower than last year. There were times when many small Wiper were being caught. Also, to date, we have received far fewer reports/complaints of over limits than we did last year. As Fall approaches, bringing with it big and small game hunting seasons, we will not be able to maintain the same level of enforcement efforts at Willard Bay that we have throughout the summer. We will still patrol it as time allows and, as always, will do our best to respond to reports of known or suspected violations. We encourage the public to report any violations they see, especially at times of the year when our officers are being pulled in many different directions. Feel free to ask myself or Mitch if you have any other questions. Thanks for your sharing. Your experience is so cool!